Avial, sometimes spelled Aviyal, is a curry made with several different types of vegetables, yoghurt, and coconut. It is seasoned with coconut oil, curry leaves, and dry whole red chillies. Feasts in Kerala are incomplete with this wholesome, creamy, lightly-spiced dish. The beauty of this dish lies in the uniformly cut, colorful, medley of vegetables cooked to al dente. There are different methods that can be used in cooking the vegetables. You could steam them, adding tougher vegetables that take longer to cook, first, and then adding the rest according the the time it will take to cook them. Or you could microwave the vegetables that take the longest to cook for a few minutes, to give them a head start, and then add them to the rest of the vegetables and cook them on the stove top, like I did in this recipe. Vegetables that are most commonly used for avial are elephant yam, raw plantain, different types of pumpkin, French beans, cucumber, drumstick, bottle gourd, carrots, eggplant, and peas. It is difficult to find fresh drumstick where I live, so I’ve used frozen drumstick that I found at the Indian grocery store. You can substitute green raw mango or tamarind pulp for the yoghurt. The secret of adding flavor and aroma to avial is the final step of seasoning the dish. So follow the steps carefully and I am sure will enjoy this simple but unusual vegetarian dish from Kerala. Cut the ends of the raw banana and cut it in half. If you have fresh drumstick, peel and cut into 2 inch pieces or use frozen drumstick. Put these two vegetables in a microwave safe bowl with quarter cup of water and cook for eight minutes. Set aside to cool. Cut the rest of the vegetables uniformly, lengthwise, into two-inch long pieces. Peel and cut the banana into two inch long pieces. In a blender or food processor coarsely grind grated coconut, turmeric powder, cumin seeds, crushed red chillies, and green chillies. In a large saucepan, over medium-high heat, add half a teaspoon of coconut oil. Add all the vegetables and sauté for five minutes. Add three tablespoons of water, salt to taste and turn the heat to low, cover with a lid, and let the vegetables cook for another five minutes. Add the coarsely ground coconut and cover the vegetables with it. Turn the heat to medium-high and let the vegetables and coconut cook until you see steam coming through the ground coconut. About three minutes. Do not over cook the vegetables. Remove from heat. Beat yoghurt with a fork until smooth. Add it to the vegetables and coconut mix. Stir gently with the handle of a wooden spoon. In a small pan, over medium-high heat, add three tablespoons of coconut oil. When the oil is hot, add curry leaves and whole dry red chillis. Turn off the heat. Pour this seasoning over the avial. Cover the dish with a lid and let it rest until time to serve. This dish goes well with steaming hot rice or as a side dish to any grand feast! Are you excited about the upcoming 4th of July celebrations? I am, because this year we will spend the day with our dear friends, the Davids, the Samuels, and the Johns. They know how to put on a show with great food, patriotic decorations, and sparklers. Last week I shared a simple potato salad recipe that you can make for your 4th of July picnic or barbecue. This week I thought I would share my recipe for Mint Limeade – something to cool you down on a hot summer afternoon. Whatever your plans may be this 4th of July – have fun and be safe. Happy Birthday, America! Bring sugar, water and lime zest to a boil in a small saucepan over medium-high heat. Stir until sugar dissolves. As soon as the sugar dissolves, remove from heat and cool. Stain and discard lime zest. Refrigerate until chilled. In a large pitcher, add mint leaves. Take the handle of a wooden spoon and gently bruise mint leaves to open it up and let their natural oils give flavor to the drink. Add lime juice, 2 cups simple syrup, 4 cups cold water, salt and ice cubes or crushed ice. Stir and taste for sweet and sour balance. Chill, strain and serve over ice. Garnish each glass with mint leaves and lime wedges. The smell of Bombay Toast wafting up from the kitchen is a delightful memory that I have from my childhood. Thick slices of white bread from Kayani bakery, dipped in a batter of eggs, sugar and milk and shallow fried in Amul butter – yum! Well, here is a bumped up version that I recently made for brunch with two of my friends. The yoghurt topping is easy to make and goes well with pancakes and waffles too. My homemade strawberry jam added a touch of color to this composition. Enjoy! Preheat your oven to 250 degrees F. Line a large sheet pan with parchment paper and set it aside. Whisk eggs, half-and-half, orange zest, vanilla, honey, and salt in a large, wide-mouth bowl. Soak two or three slices of bread, at a time, in the egg mixture for two minutes on one side. Turn them over and soak the other side for two minutes. Place a large frying pan over medium heat. Add one tablespoon oil and one tablespoon butter. When the butter melts, gently add the soaked slices of bread. Cook for two to three minutes on each side, until nicely browned. Fry the remaining soaked slices of bread, adding oil and butter as needed. Place the prepared Bombay toast on the sheet pan and keep them warm in the oven until ready to serve. 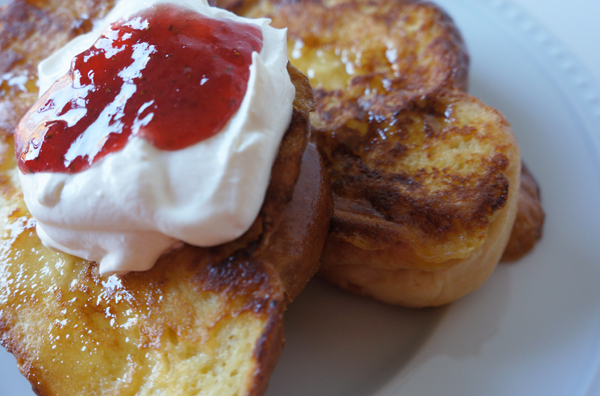 Serve with maple syrup, yoghurt topping and jam of your choice. Whisk the yoghurt, cool whip and maple syrup in a small bowl until creamy and smooth. Keep refrigerated until ready to serve. For the past several years, my friends and I plan a family brunch during the Christmas holidays. Our children have grown up with this tradition, and they look forward to the occasion with anticipation. 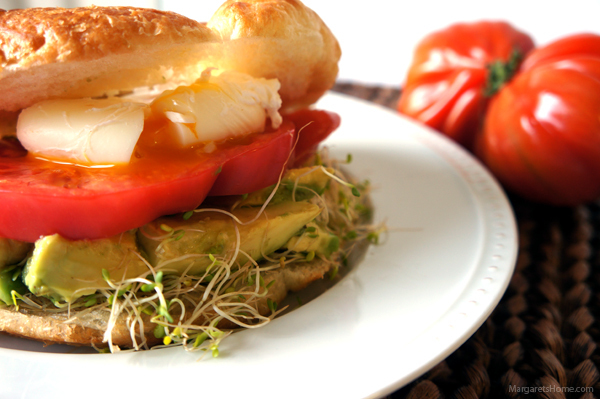 Croissants with poached eggs, avocados, tomatoes, sprouts, and hollandaise sauce is Carla’s favorite item on the menu! While we were planning the menu this past year she whispered, “Aunty Maggie, are you making that croissant and egg thingy?” I loved the compliment because Carla is an accomplished baker, cook, and entrepreneur. Here is a link to Carla’s website. Poaching eggs, to some, may sound daunting, but it’s easy. I’ve created a video to show you how. I am a novice at online videos, so please be patient as I learn. This recipe looks long because it has three components. Poaching the eggs, making the hollandaise sauce and assembling the croissant sandwich. Trust me, it’s worth every bite. I’m sure at least one person would readily agree! Slice each croissant in half, place them cut side down on a baking tray and toast them in an oven set at 350 degrees for five minutes. Poach eggs (see video on how to poach eggs), and make the hollandaise sauce (see recipe below). On the bottom half of each croissant put alfalfa sprouts, avocado slices, tomatoes, a poached egg, a tablespoon of hollandaise sauce and then the top half of the croissant. In a saucepan add the yolks, water, lemon juice, and butter. Turn heat on low and keep whisking constantly. You will see bubbles forming along the edge of the pan and in about eight minutes the sauce will start to thicken. Remove from the heat. Season the sauce with chilli powder and salt.